Apart from its beautiful bistro look and classy ambiance, Loewy has its own story to tell behind the bar and the hot kitchen. There must be a reason why Loewy never loses its charm after all these years. Its existence in Mega Kuningan can only be contended by E&O as its sister restaurant across the street. Above that, Loewy has its own crowd, a whole different atmosphere, and the right ingredients craved by its patrons from time to time. This beautifully adorned restaurant is an elegant crossover between Parisian-style bistro and the feel of New Yorker bars of the 1940s. Some might dare say that the appearance of the bar itself may remind us about the Prohibition era where speakeasies are rampant and Loewy is no short classier than any of those from that period. While waiting to be seated, the bar’s always open for you. Comfortable in any ways possible, Loewy gives you the leisure experience in every corner of the place. From the hot kitchen, Loewy uncompromisingly presents fresh take of European cuisine from the adept hands of Chef Benoit Claeys; and we sample four out of the six dishes from the latest special on the menu. The appetizer is an intriguing grilled Brussels sprout salad with kale, goat cheese, and lemon-mustard vinaigrette. It is a flavor packed, highly appetizing salad consisting of healthy ingredients in generously portioned like any other delicacies you would find at Loewy. Fresh Brussels sprout salad served with an authentic sour and salty taste. If you are looking for something fulfilling and casual, try a great pair of Loewy Club Sandwich, which contains scrambled eggs and truffle oil, poached chicken, beef bacon and ham as the filling. Having the sandwich accompanied with the string fries is indeed a great choice. 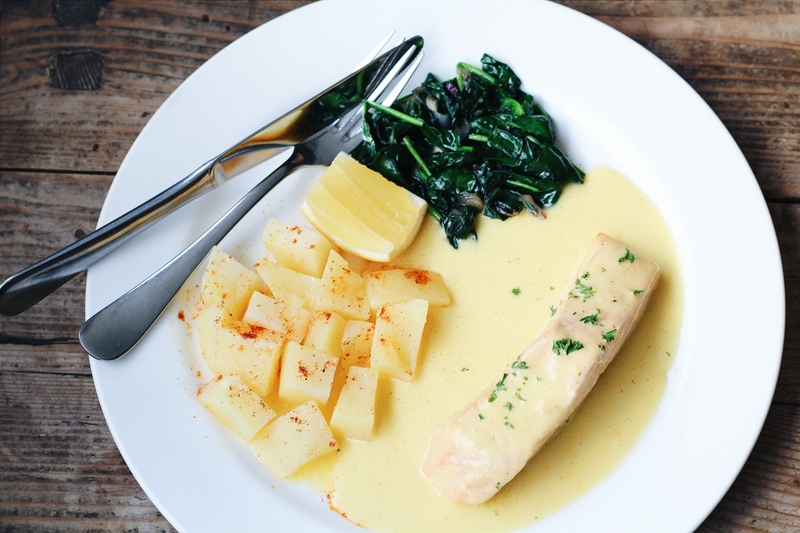 For a more chic choice, we would opt again and again for the poached Norwegian salmon – all smooth and silky, with baked potato in delicious mousseline sauce and sauteed baby spinach. As for good closure, Loewy’s homemade sticky pudding with caramel deserves a credit as one of the best desserts in the J-Town. To add the indulgence, a scoop of salted caramel ice cream is put on top of it. Absolutely delish! The sticky caramel pudding is the best way to close your dining course. The Loewy Club Sandwich won’t fail to satiate your hunger. So, well, that explains why Loewy never runs out of charm because of its creative take upon the bountiful food and drinks in the house. What you should do next is to schedule your visit whether for a solid breakfast, a brisk business lunch, or a long weekend evening with your friends; and be sure to mingle around with the beautiful people here.